National Health Blog Post Month, Day 3: Dear 18 year old me. Write a letter to yourself when you were 18. Be sure to tell yourself what to do more of, what to do less of, and what you have to look forward to in the next few (or several) years. Congratulations, you’re an adult now! Well, at least on paper. I know it seems like you are ready to take on the world, and in many ways you are. In other ways, you don’t know the first thing about what you are getting yourself into. You’re in luck though. I, your older and much more attractive self, have figured it out for you. No no, you don’t have to thank me now. I will bestow all of this to you as time goes by. It’s just a nice thing that I am doing for me…I mean, you…um, us. Whatever. Time travel is confusing. You have lived your entire life up until this point without anyone else that understands what it is like living with diabetes. You’ve had to carry the diabetes burden all on your own, and that has made you stubborn as a mule. The truth of the matter is that you don’t know what you don’t know. There is an entire world of people out there with diabetes, just like you, who need each other just as much as you need them, and none of you know it yet. 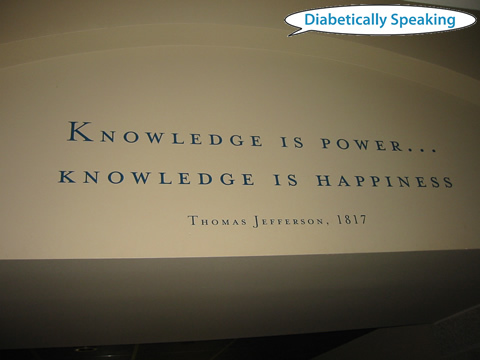 But you will, and you will all play a key role in changing the way people with and without diabetes, doctors, and healthcare professionals everywhere think about living with diabetes. To get there, you must have vision, take risks, and test your dreams against your beliefs. Dream big, and laugh often, and out loud. Good or bad, don’t keep things inside where nobody else can get to them. Learn how to communicate your dreams. As competent and reliable as you are, you can’t do everything on your own. You are going to need an army behind you to do the amazing things that you are going to dream up. You’re a natural storyteller, so use that to your advantage. Bring it to life. Make it entertaining. Inspire others to help bring your stories to life. When it comes to others, surround yourself with people that inspire you as well. Don’t ever settle with people that don’t encourage and support you. It’s okay if people disagree, but it’s not okay for people to hurt you. Be aware that there is a difference. Be cautious of any person that says, “That’s the way it has always been done.” Bring people into your world that will help you move mountains, not who hold you back. Be a character that has good character. In the decisions you make, always ask yourself, “Is this something that I am proud of?” Be bold. Be kind. You are your own brand in everything that you do. If you believe in your brand, other people will believe in it as well…and ultimately, will believe in you. You won’t always win, but even when you lose, don’t lose the lesson. Commit to the decisions that you make, and be willing to be wrong and learn from your mistakes. You will find that sometimes you have to completely break something in order to fix it, and there is no shame in starting over from scratch. Help them to feel better. LOVE THIS POST!! Future Martin is full of great advice. I especially loved the “Be a character that has good character.” These are nuggets of wisdom all of us need to remember every day. Love you! Love the post, Martin. Smart, wise. I particularly like “be a leader with a servant’s heart”. Nice. ALL people who lead should take that to heart. he’s right, you know. you are a natural storyteller. love this. this is great! and you are a wonderful storyteller! Great post Martin, and some great advice. I especially love the part about asking yourself, “is this something that I am proud of?” with each decision you make!